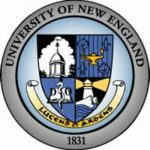 The University of New England opted to have both the MEPs and Refrigeration complete design build agreements. Both the HVAC and Refrigeration Contractors came together to provide a unified system to reclaim heat and provide AC when the ice was not in. The Architect, Sasaki Associates, had a challenge to reduce the size of the building program by 5,000 square feet to allow the construction to move forward within a hard determined budget. The Town of Biddeford also wanted a good sightline from the road with mechanical equipment shielded. The University had a hockey program but it was always held at a local municipal rink so this was a big step. The building would serve many needs: an Athletic and Sports Medicine Center to include multi use classrooms, workout areas, hockey arena, basketball courts and home to the athletic department offices as well as a cafeteria for this end of the campus. Emerald Environmental Technologies worked with the electrical, refrigeration, and HVAC contractors on resolving these challenges. By installing a roof mounted dehumidifier and HVAC unit above the third floor mechanical room space was gained to allow ice3 Cubes, fluid cooler, electrical room and boilers on this level. This in turn eliminated the need for a refrigeration and electric room on the first floor as well as a ground mounted fluid cooler near the road. The building space was also resolved to fall within the parameters of the square footage desired. Being modular, the ice3 Cubes could easily be installed within this newly defined mechanical space and the small refrigerant charges allowed cohabitation with boilers. The next recommendation was to install six initial ice3 Cubes and provide a slot and infrastructure for a seventh Cube as a summer program and possible summer AC would be needed. 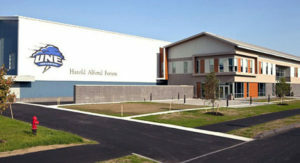 Since the ice3 Cube heat reclamation was not large enough to heat the entire building, a design for the classrooms and workout areas beyond the gym and hockey arena was incorporated into the design. It would be beneficial if thermal loads could be shared. So a water source heat pump system was chosen and rejection of heat and cold was to the ice3 Cube warm loop where it was either reclaimed, reheated by the boilers or rejected by a common fluid cooling tower. Kitchen ventilation air as well as ventilation air for the facility was preheated by the ice3 Cube reclaim heat. The modular design, relative small size and quiet operation of the ice3 Cubes opens up design possibilities that are typically not an option with conventional refrigeration plants. In this case, the Cubes reside in a large mechanical room next to a conference room on the second story of the building. Enough room was gained that an equipment well was created for the fluid cooling tower with shielding from the road so no outdoor equipment was visible. The low refrigerant charge is a game changer when it comes to designing the mechanical room itself, and the fact that the ice3 Cubes can cohabitate with other devices in a common mechanical area often benefits our end users with both monetary and practical gains. In this design, the complete melding of mechanical systems was estimated at saving $55,000 a year in propane. The original plan was to not have AC in the gym. However since ice3 Cubes were installed the excess capacity was used within the gym creating a controllable space year round. Even the walk in coolers and freezers are water cooled and provide thermal energy to the water source heat pump loop.